Describing themselves as "Psychedelic Dub", the duo of Dave Bellard and J. Mundok have released two CD's covering somewhat different territory. I'm not well versed in the genre but in its basic form it started in Jamaica as D.J. treatments of existing Reggae recordings adding echo and various other efx. 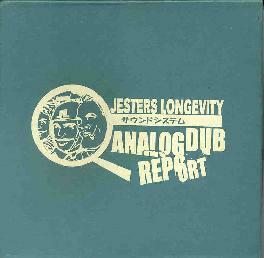 The "Analog Dub Report" disc is a trancey drum 'n bass collection of tunes. As I listen I suppose that psychedelic Dub is an appropriate term for the music. Much of it proceeds at a slow pace but is clearly meant to be danceable. It really does have a nice groove to it, but as far as dancing goes I can only imagine people on valium who still have a bit of energy left to cut some rug. The D.J. treatments are all here with voice samples and such, but are effective for this listener because they are used sparingly. One tune that grabbed me is also one of the shortest. "Brasil" is a two minute piece with a repeating guitar bit that is so simple but has such a nice groove to it. It "breaks down" periodically, probably due to looping which is an odd effect that I still thought was pretty cool sounding. But it's soon joined by a spacey synth melody that is, like the guitar, simple but effective in combination with the guitar. The longest track on the disc is also the most different, and probably the one that would most appeal to AI readers. It's an ambient electronic journey that strays ever so slightly into drum 'n bass territory, and is embellished by bits of percussion. 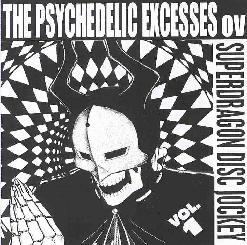 The title of "The Psychedelic Excesses ov Superdragon DJ" describes exactly what this disc is about. It's DJ treatments of Reggae recordings. It's all very start/stop herky jerky with endless sampled sounds and voices. Certainly not my idea of psychedelia but there's no question that this is pretty freaky stuff. Just not my cup of tea. In summary, there are certainly moments on Analog Dub Report that would appeal to AI readers, but I'd avoid the Superdragon DJ disc. Both CD's are available through Jack Kettle Records.